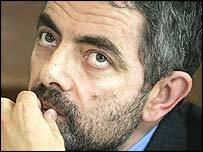 Comedian and actor Rowan Atkinson has branded as "draconian" plans to make incitement to religious hatred illegal. He said it was a "sledgehammer to crack a nut" and urged that existing race hate laws be amended rather than hampering the right to criticise ideas. Performers would end up censoring themselves for fear of prosecution and that would hit free speech, he said. The plans - which have been failed to make it through Parliament twice before - cover words or behaviour intended or likely to stir up religious hatred. Home Office Minister Paul Goggins has said: "It is about protecting the believer, not the belief." But a series of speakers from politics, civil liberties groups and from the arts were in Westminster on Monday to voice their concerns the day before the bill comes back before Parliament for its second reading. Liberty's Shami Chakrabarti brushed off Mr Goggins' reassurances saying: "In a democracy there is no right not to be offended. "Religion relates to a body of ideas and people have the right to debate denigrate other people's ideas." She said where people used religion as a proxy for expressing racism the existing race laws could be amended to encapsulate that. The National Theatre chief Nicholas Hytner said it was sometimes the business of his profession to offend. He gave the example of Jerry Springer the Opera which he argued was clearly an attack on the chat show genre and not, as some claimed, on christianity. Author Ian McEwan said religions all thought they held "irrefutable beliefs" and only a secular society could ensure true freedom for them and for others' right to express criticism. Labour MP Bob Marshall-Andrews, who was joined by Lib Dem and Conservative colleagues, said people's race was what they were, their religion was what they believed. "Hatred of what you think is much harder to define than hatred of what you are," he argued. The speakers emphasised that any decision to prosecute under the legislation would be decided by the attorney general, a politician and conviction carried with it the risk of a seven-year jail sentence. Mr Atkinson said: "What's most creepy about this bill is the decisive power it hands to the government." Mr Goggins has said he does not expect many prosecutions under the new laws, but said it was important for Parliament to send out a clear message. "People of all backgrounds and faiths have a right to live free from hatred, racism and extremism." Religious hatred is defined in the Bill as "hatred against a group of persons defined by reference to religious belief or lack of religious belief" - showing it will also cover atheists. Race hatred laws had resulted in 76 people being prosecuted in nearly 20 years, with 44 convictions. Lib Dem Evan Harris, Tory Dominic Grieve and Mr Marshall-Andrews are all backing an amendment which they hope will change the race hate laws. But are the Commons defeats more serious for the prime minister's prospects? Would the new law work?